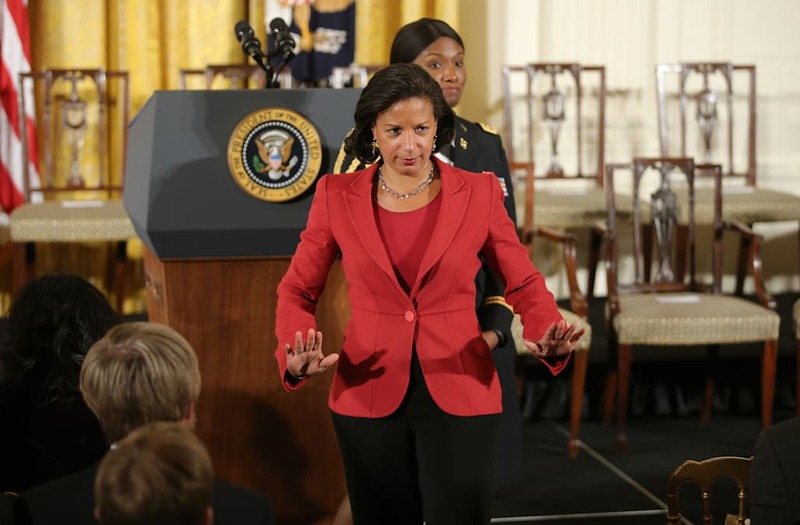 Former national security adviser Susan Rice categorically denied there was any political motivation behind her requests during the final days of the Obama administration to "unmask" the identities of U.S. persons listed in foreign intelligence reports. "The allegation is that somehow Obama administration officials utilized intelligence for political purposes. That is absolutely false," Rice said in a Tuesday afternoon interview with MSNBC's Andrea Mitchell. The names of U.S. persons are typically redacted in surveillance reports, but can be "unmasked" at the request of senior officials if it may be pertinent to intelligence concerns. On Monday, Bloomberg reported that Rice was responsible for dozens of "unmasking" requests in connection with intelligence reports tied in some form to associates of President Donald Trump's campaign. Rice, in the interview, acknowledged that Trump associates may have been incidentally picked up by surveillance activities, and that she then may have sought to learn their identities in the reports she reviewed. But, she maintained, such requests would have been a "necessary" part of her role in reviewing intelligence reports as national security adviser. "Yes, they could have, that is possible," Rice said. "The fact is, if whether we're talking about Russia or any other topic, if I saw an intelligence report that looked potentially significant ... If I read it and I think in order for me to really understand is this significant or not so significant, I need to understand who the U.S. person is, I can make that request." She added: "That's necessary for me to do my job." Republicans have raised concerns that unmasking led to leaks that brought down former Trump national security adviser Michael Flynn, who was forced to resign after reports emerged he had discussed American sanctions against Russia with the Kremlin's U.S. ambassador, and then misled Vice President Mike Pence about that fact. Flynn was also later found to be a paid foreign agent of the Turkish government, a position he had not previously publicly disclosed. Rice on Tuesday declined to address concerns about Flynn specifically, citing the classified nature of the reports she reviewed. But she maintained that she played no role in any potential leak, whether related to Flynn or anyone else. "I leaked nothing to nobody and never have and never would," Rice said. She later added, "The notion ... that by asking for the identify of an American person, that is the same as leaking it, that is completely false. There is no equivalence between so-called unmasking and leaking." The disclosure that Trump associates were incidentally swept up in U.S. surveillance was made last month by House intelligence committee chairman Devin Nunes, R-Calif. Their actual communications could have been collected, or their names merely could have been mentioned by others during intercepted conversations. Trump has said the discovery "somewhat" vindicates his unsubstantiated statement on Twitter on March 4 that he had been wiretapped on the orders of former President Barack Obama. The FBI director and the top Republican and Democrat on the Senate intelligence committee have said they've seen no evidence to support that claim, while Nunes has said there is no evidence of a "physical" wiretap of Trump Tower as the president alleged. In her interview Tuesday, Rice also flatly rejected Trump's assertion. "Absolutely false," Rice said, "and the intelligence community, the director of the FBI, has made that very clear. There was no such collection, surveillance, on Trump Tower, Trump individuals." The number of intelligence reports provided to senior Obama administration officials, she said, accelerated as the intelligence community learned more about Russia's interference in the 2016 election. "I can't say the pace of unmasking requests would accelerate. But if you're asking if there were more reports provided to senior U.S. officials after the president requested the compilation of the intelligence, which was ultimately provided in January, the answer is yes," Rice told Mitchell. "They went back and scrubbed more reports, they began to provide more such reports to American officials, including myself."